The wealth gap is growing. The predators continue to improve their craft, amassing wealth as they evolve to prey on the silent lower class. But the lowly workers continue to be exploited for the fruits of their labor. It’s a situation that’s only gotten worse over time. And scientists are only starting to truly understand the scope of the inequality. I’m talking about predator-prey relationships in marine ecosystems. Indeed, the history of all hitherto existing marine society is the history of predator-prey struggles. What did you think I was talking about? 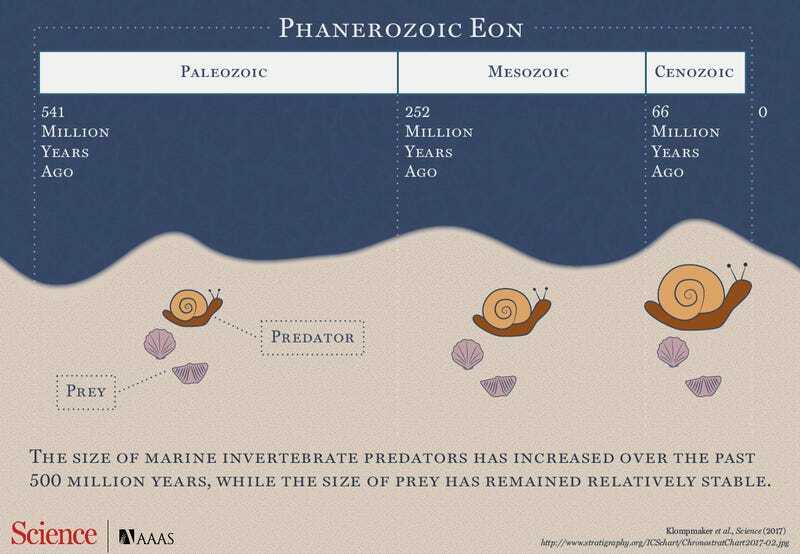 A team of researchers from the United States looked at the relationship between the size of drill holes in marine shells made by drilling predators (like snails) to create a vast picture of predator-prey relationships over the entire history of animals. They found that over all of history, the size gap between the two has grown as predators compete and larger ones win. It’s a truly groundbreaking finding. The team compared a huge dataset with 556 predators and the size of the drill holes they produced, looking at data from 6,943 drilled specimens. The shells didn’t show any trend in increasing or decreasing size, but the drill holes in the shells increased from .35 to 3.25 millimetres in median diameter. And this is a trend that’s been going on for all of animal history, according to the paper published today in the journal Science. But this lower class isn’t completely defenceless. That’s important too, pointed out Michigan State University assistant professor Phoebe Lehmann Zarnetske in an email. “Combining modern-day insights about the causes for changes in biotic interactions (e.g., increased prey mobility, environmental change) with patterns in fossil records, is a powerful way to assess how and why biotic interactions change over time,” she said. Mollusks of All Biomes, Unite! The study does have limitations, Klompmaker pointed out. The data resolution isn’t great for individual periods. This means that the trend might be occurring for animal history, but it’s hard to say anything about individual periods, kind of like the way that a capitalist system might not oppress you every day, but income inequality is still getting worse over time.